Harvard Square is closing out Style HS406 HARVARD SQUARE 100% Cotton Long Sleeve Ladies' Peached Twill Shirt. 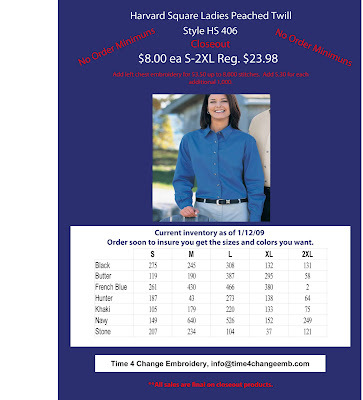 The HS406 has been a staple and popular Ladies button down shirt for many years in the Harvard Square line up. But with the introduction of new styles and brands Harvard Square decided it was time to take this one out of the lineup. These shirts are priced to sell fast. Regularly priced $23.98 they are now just $8.00. For left chest embroidery up to 8,000 stitches add $3.50 and $.30 for each additional 1,000. The HS406 is a 5.5 oz 100% cotton twill. Spread collar. Seven button reverse placket. Double needle tailoring. Silicone washed for softness. Sleeve placket with button. Adjustable button cuffs. The flyer insert shows current inventory as of 1/12/09. Order soon to insure you get the color and sizes you want. If you have any questions please call or e-mail.